The current year’s volume (Table of Contents) is available from Haddington House for $20 in Canada, $25 in the U.S., and $25 overseas (including postage) — all prices are in Canadian dollars. To purchase, please email your request to us at haddingtonhouse@eastlink.ca or click the Buy Now button below to order using Credit Card or PayPal. 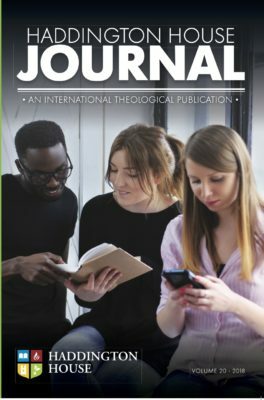 In order to promote student and staff journal reading in theological colleges in the majority world, Haddington House offers grant subscriptions. To apply for such, contact the editor at haddingtonhouse@eastlink.ca. Donations in support for these grants are welcomed. See Donations. The Table of Contents for each volume of the Haddington House Journal is available in the list below. Please note: Back volumes are available in full as pdf files. See Back Volumes.